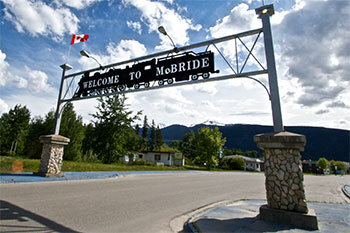 The Village of McBride is a small, vibrant community situated along the Yellowhead Highway 16 between Jasper and Prince George. The railroad, forestry, tourism and small business all contribute to the local economy. Fire protection is provided through the volunteer fire department. If you are thinking of retiring here, you will find Village life perfect for you. Even though you are surrounded by mountains the Village is flat and perfect for walking. Living in McBride, all of your services will be available within walking distance including the library, live theatre, community hall, and recreation centre. The Robson Valley Recreation Centre hosts activities year round. It boasts a regulation sized hockey arena and two sheets of curling ice. A fully equipped fitness facility is available for your workout. The Recreation Centre also has what is known as a "convertacourt" that allows the space to be configured for squash, racquetball, and wally ball; by using the full surface there is space for other indoor sports. Other recreation activities including badminton, basketball and pickleball are available in the McBride Secondary School. The Robson Valley Community Centre is a beautiful space with a stage and dance floor; it is the perfect space for theatre performances, conferences, wedding receptions, tradeshows or family reunions. The Roundhouse Theatre is located in McBride Secondary School and has provided live professional entertainment for residents for more than 15 years. There are both a local Arts Council and a local theatre group to round out options for leisure activities. You and your family will make friends easily in this friendly community, and your children will enjoy the freedom and safety that is so much a part of small town living. Recreational opportunities are just outside your door in summer and in winter. Hike the alpine or fire up the ATV in summer and go exploring; in winter you can snowshoe or cross country ski and you are in the best snowmobiling country in the world. A new mountain bike club is working on bike trails and there is an active cross country ski club. The Robson Valley Horsemen Association offers numerous activities and many non-motorized, multi-use trails for horseback riding. Health care services are available at McBride and District Hospital which has been a fixture in the community for 50 years. Public school students attend McBride Elementary and Secondary School, and the Robson Valley Junior Academy, run by Seventh-day Adventist, also educates children from grades 1 – 8.